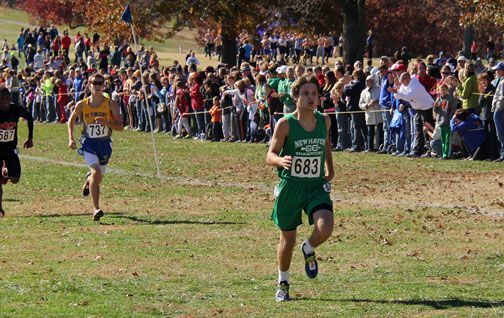 While New Haven’s other senior on the boys team, Zach Grater’s 43rd finish did not get him a state medal, he knocked off a minute from last year’s time of 19:20 (81st place) by running 18:28. New Haven’s only senior girl, Fey Chavez, had her best state finish, coming in 32nd, but even more impressing, ran one minute and 15 seconds faster than last year and just seven seconds shy of a career best time, which she ran at a much easier course in Owensville. (22:11). In her second straight appearance at state, Chavez’s time was 22:18. Great job Fey. Expect great things in the future for freshman Emily Lewis, who finished 57th in her first trip to state, running a time of 23:20 and a season best for her. We will have much more in our exclusive coverage on New Haven’s All-State day in Jefferson City, including interviews with both Schenck and Pataky as well as Coach Tucker’s thoughts about his team’s performance. Congratulations Zach, Seth, Dominick, Fey, and Emily on your great performances at this year's State Cross Country Meet.